Note: We are licensed for Non-Transient Accommodation and have a one month minimum stay. Discount available for stays of three months or longer. •	Sealy Posturepedic Pillow-top king Size bed. •	39' Smart TV -- equipped with Roku and Netflix. Easily connects to your computer. No cable vision. •	New contemporary furnishings with seating area and desk. •	Appliances include ceramic-top range, dishwasher, fridge and microwave. •	Kitchen includes: blender, coffee maker, toaster and all dishes/pots and pans. •	Original fireplace with electric insert. •	Coin laundry available on the ground floor. 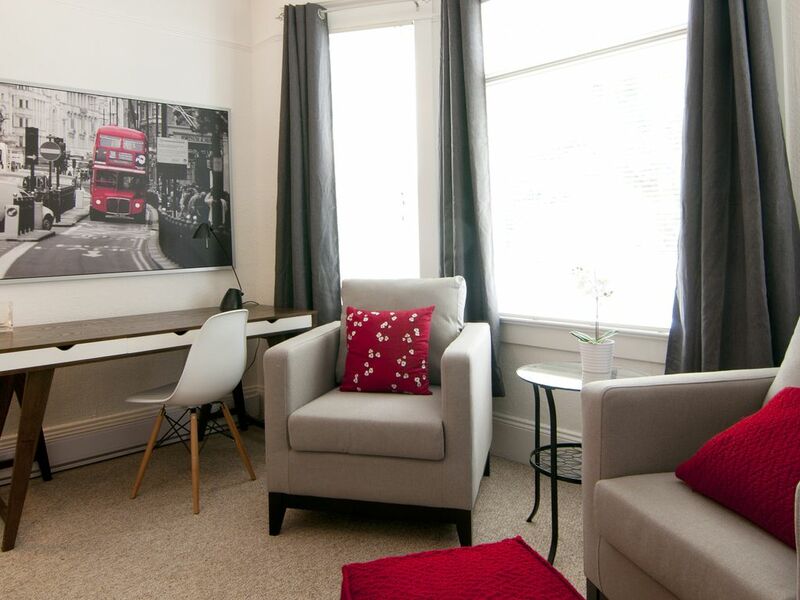 Fernwood House is centrally located in the heart of Victoria. •	Royal Jubilee Hospital is an 8-10 minute walk away. •	The quaint Fernwood village is a 3-5 minute walk and includes the famous Balfry Theatre, Fernwood Inn, Stages Bar and a number of other lovely businesses. •	Hillside Mall is a 3 minute drive or 15 minute walk and offers Thrifty's Foods, Starbucks, Shoppers Drug Mart, BC Liquor Store and dozens of other retail shops and restaurants. •	Camosun College is a 15-20 minute walk. •	The University of Victoria is easily reached by bus, bike or car - or a 30 minute walk. My wife Heidi and I, and our high school two school-aged children, love spending time outdoors (canoeing, hiking, kayaking and surfing) and traveling. Our main base is in Vancouver but we also spend time with our family in Victoria and at our home on Mayne Island. Most of our rental properties are long term but we are pleased to offer two units for shorter term rentals. We are members in good standing with Landlord BC and enjoy taking good care of our tenants and our rental properties. In 2016 we purchased the six-unit Fernwood House in Victoria so we would have a place to stay when we are on Vancouver Island. The Ferwood area has a great vibe and we love walking up the Cornerstone Cafe for a coffee or to the Fernwood Inn for dinner. We recently finished renovating and furnishing this unit for rentals of 1-12 months. View our other VRBO one bedroom listing at 989015. We have stayed at many VRBO properties around the world and know that you will enjoy this great central location in Victoria. Lots of nice new towels! Accessible by walking (25 mins), bike (10 mins) or bus (8 mins). 3-4 minute walk from the charming Fernwood Village. Enjoy the Fernwood Inn, Stages Wine Bar and the Balfry Thatre. New kitchen with dining table for four. Equiped wth everything you will need for a short or long stay. It was a fun place to use as a base, clean and inviting. We experienced neat eating spots, BC Museum with Bohemian Rhapsody in Imax. Great to meet you, even if it meant some work. Suggest a reading lamp by the front window. We'll try next time to come without the snow. Oak Bay Beach Hotel was a delight. Cheers and all the best, Ted & Elaine. This is a very nice, clean unit in a quaint area of the city that's close to everything. Neil was easy to communicate with and made sure we had what we needed. We would definitely stay here again! Awesome comfortable place! Local incrível ! We stayed in this fantastic condo for a month! The house is situated in a very nice neighborhood, The suite is perfect for a couple, it has a magnifc king bed, a fully equipped kitchen and a very good bathroom. I wish we could stay longer! Ficamos aqui por um mês. O lugar é incrível, super aconchegante e confortável. A 30 minutos a pé do centro, ou 15 minutos de onibus que passam na frente ou esquina. A cozinha é roda equipada faziamos nossas refeições e economizamos bastante assim. Cama muito Boa, King, banheiro excelente! Recomendo a todos !!!! Fernwood House was an excellent home base for us while visiting Victoria. The property is well maintained and our accommodations were very inviting. Large king bed was comfortable and the amenities provided left us needing nothing. Nicely stocked kitchen and a big bathroom. The added plus is that Fernwood house is located very close to downtown where we spent most of our time so getting around was easy. The house is older but the rental space has been updated and we enjoyed the well done decor and clean organized space. The bed and pillows were so comfortable, like being at home. The kitchen had everything we needed and the bathroom was beautiful and functional with hanging space and shelving for all our clothing and accessories. The Netflix and WIFI access kept us entertained on the days we stayed in for a few hours to relax. We had rented bikes instead of a car so spent many hours touring the downtown area as well as our neighborhood. We aren’t accustomed to having access to bus service but took BC Transit to Butchart Gardens and to the airport. By using the Maps app on our phones even those of us new to transit were able to find the routes we needed to take. Getting a day pass was easy as boarding the bus, telling the driver what we needed and each sliding a CA $5 into the machine beside him - out popped day passes. We enjoyed the house, biking to area attractions and the downtown area - was a great vacation! Extremely Central: Short walk to Hillside Mall, Royal Jubilee Hospital, Camosun Collge and Ferwood Village. On two bus routes with easy access to downtown, University of Victoria and Royal Victoria Hospital. Stay in the charming Fernwood residential area with easy access to all the tourist sites and services.